I am so happy to welcome Jean Flowers aka Camille Minichino to Escape With Dollycas today!! Her new book was released on July 25! My newest series, the Postmistress Mysteries, debuted in November 2015 with DEATH TAKES PRIORITY , followed by CANCELLED BY MURDER . The third in the series, ADDRESSED TO KILL is now out (July 2017). Here’s a question I know I’ll be getting at bookstores and other events: Can I read this one without reading the first and second? I’ve never understood why some think reading in order is important in a series. I imagine these readers at a party, being introduced to someone new, discussing shared experiences, really hitting it off. “Let’s be friends,” the new person says. The way it usually works in real-life friendship is that you can start it at any age, with people of any age. As the relationship grows, each person’s backstory is revealed, not necessarily in chronological order. It’s the same for me with characters in a book. If I happen upon book four of a series and it looks interesting, I’ll read it, then decide if I want to know more about the protagonist—what brought her to this point, what other adventures she’s had, what she’s learned from them. I’ll then pick up either earlier or later books, depending on what’s available. Of course, it’s different for a trilogy or other format where the story is deliberately set up in a certain order and the last line in book one connects to the first line in book two. Even then, a “prequel” might be introduced to reveal pre-prehistory. It’s also sometimes different for tv shows, where it’s hard to understand an episode unless you’ve seen the “previously on”s. But each book in a mystery series should stand on its own, with relatable characters and a story that has a satisfying conclusion. If you’ve started with book five of a series and have no idea about the motivation of a character, or if you feel you’re missing something, it’s the author’s fault. Every book should be a standalone. Many people, especially writers, read the ending of a book before they finish, wanting to know how the author leads up to the denouement. Talk about reading out of order! As a more or less reasonable segue: I once received a nasty email from a reader, railing at me for a casual remark in one of my books, that revealed the ending to “Murder on the Orient Express.” The person called me “thoughtless,” and guilty of “ruining the experience” of reading the 75-year-old Agatha Christie classic. At what point does it become okay to discuss an ending? Or to tell a reader of the second book in a series what happens in the fourth? Do high school students not know ahead of time that Romeo and Juliet die at the end (oops, spoiler)? Do adult film fans not know that Anthony Hopkins’s mother’s corpse is in the house on the hill? That Ilse chooses her husband over Rick? I’d better close before I get another nasty SPOILER! email. Thank you Camille for visiting today!! Camille received her Ph.D. in physics from Fordham University, New York City. She is currently on the faculty of Golden Gate University, San Francisco and teaches writing throughout the Bay Area. Camille is Past President and a member of NorCal Mystery Writers of America, NorCal Sisters in Crime, and the California Writers Club. 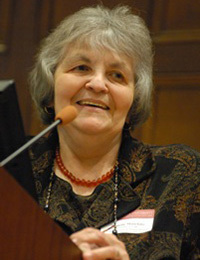 Camille has published over 20 novels and many short stories and nonfiction articles. As Camille Minichino, she’s published Periodic Table Mysteries , featuring retired physicist GLORIA LAMERINO. As Margaret Grace, she writes the Miniature Mysteries , featuring miniaturist GERALDINE PORTER and her 11-year-old granddaughter, Maddie. The 9th in the series, MATRIMONY IN MINIATURE was released in September 2016. As Ada Madison, she’s published the Professor Sophie Knowles Mysteries , featuring college professor SOPHIE KNOWLES. As Jean Flowers, Camille writes The Postmistress Mysteries . The third in the series, ADDRESSED TO KILL , will be released in July 2017. A stand-alone, KILLER IN THE CLOISTER , is available on Kindle and CreateSpace. People should not host events at the post office! That way lies madness! A new to me author. I like her take on reading series in order. I really enjoyed learning more about Jean/Camille and what other books she’s written, thank you for the giveaway! This cozy sounds intriguing and unique. A new author for me. Sounds like a good read. This sounds like a great cozy! New series to me. It looks great!!! Thanks for the review! I am not the type of person to read a series in order (other than LOTR when I was young and I started with The Hobbit). I always pick up one and read from there. I like your way of thinking on that. Hi Jean, I’m so glad to see this new series. I’m looking forward to reading this. And thank you Lori for such a wonderful site and reviews. I just love this site and all that you do. Thanks for the chance! I love that her books can be read as stand alones and that each book has a conclusion ! I really enjoyed the post by Jean/Camille. I agree that all books in a series should be a stand alone book. 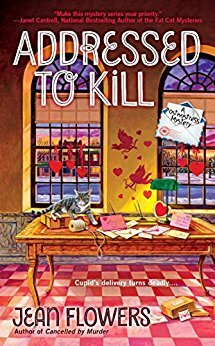 “Addressed to Kill” sounds like a great read, looking forward to reading the book and the series. I’ve read other of her books and am looking forward to this series. I like reading series in order, but I agree that it works to read the one where you’re at and see if you want to go backwards. I have read the first book in these series and can’t wait to read the next two! Sounds really great–I’d love to read it! I love & have read all of this author’s wonderful series. Thanks for the giveaway. NEW SERIES TO ME! THANKS FOR THE CHANCE! One of my favorite cozy authors! With mysteries, I find that it’s not necessary to start at the beginning of the series, however I still do it most of the time.